The honeycomb stitch is an classic stitch mostly used in vintage patterns for lace coverlets and tablecloths. Use this stitch for a long table runner in a fun, bright color and bring a classic stitch out of antiquity! Repeat Rows 3-6 until desired length is reached. This stitch is one that looks best when blocked, depending on the type of yarn you are using. 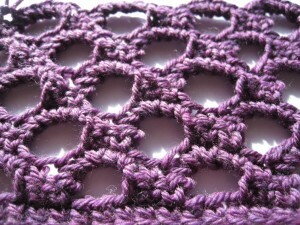 Check out Blocking Crochet for more information on what blocking is and how to achieve it! Have any questions about this honeycomb stitch? Don’t hesitate to ask! This entry was posted on Tuesday, March 8th, 2011 at 12:00 AM by Erin Burger	and is filed under Free Crochet Patterns, Tutorials and Help. You can follow any responses to this entry through the RSS 2.0 feed. You can leave a response, or trackback from your own site. …. how do I finish this one off?!?? Very pretty. Did you make this one up? I love this pattern. I was wondering if it could be done using #10 Cotton Thread for a doily and if so what size hook do you think I should use? Hi Lynn, sure you can use size 10 thread. A US 7 (1.5 mm) hook would probably be good, but feel free to experiment with other hooks if you’d like. What yarn and hook would you be using. Hey there. After I reach desired length, how do I end so the final row matches the starting row? It is intended to look different from the beginning. But if you want, you can try single crocheting into each of the stitches across the row. I am a novice but this is the pattern that made me want to learn how to crochet. A beautiful pattern! I’m not sure what hook Erin used in her tutorial. My guess is that it may be a H (5.00 mm) hook. You can really use any hook that gives you the tension that you like. It will depend on how tight you crochet. Yes, please do try the single crocheting at the end.